Swing doors for freight elevators are the ideal choice when you are faced with tight shaftways and space parameters that do not accommodate sliding door specification requirements. TRICO offers you ideal solutions to all of your freight elevator door needs including some of the highest quality swing doors available in the industry. At TRICO, every swing door we sell is constructed to meet our highest standards, and TRICO’s quality service and affordable prices are anything but standard. Swing Doors - Consist of one panel containing heavy duty half surface ball bearing hinges that are set in a steel channel door buck. 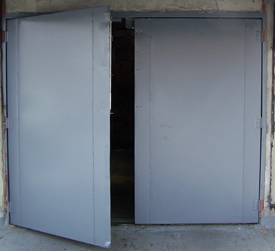 Center Opening Swing Doors - Consist of two panels each panel containing heavy duty ball bearing hinges, which are set in a steel channel door buck. Slide Swing Doors - Mounted in conjunction with a Swing door with the capability of a full opening, slide and swing open simultaneously. To order your swing doors for freight elevators, contact TRICO at (718) 349-6565, download our brochure, or e-mail us at orders@freightelevatordoors.com. Our knowledgeable sales professionals are standing by ready to assist you with any questions you may have concerning swing doors, freight elevator doors or any of our other products.